Spider Solitaire is undoubtedly one of the most played solitaire card games in the world. This fun and addictive classic game is often called "the King of all solitaires". It has inspired the invention of a number of new variations of this game, including easy (one suit) and medium (two suit) versions. Traditional version is played with two decks of cards, using all four suits. The object of the game is to build 8 sequences down in suit within the tableau (each running from King to Ace) and then move them to 8 foundations. Not every game of Spider Solitaire is winnable, but you can improve your chances of winning by carefully planning your moves. Obviously, there is luck involved, but it is most definitely a game of skill. 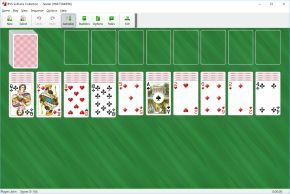 BVS Solitaire Collection 8.1 for Windows XP/7/8/10 is a high quality collection of 520 games. It includes Spider and 25 games that are similar to it. 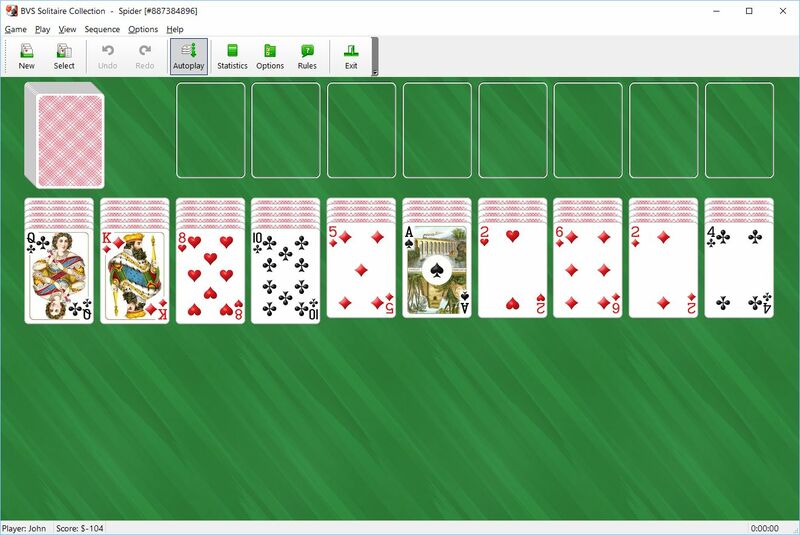 Buy BVS Solitaire Collection now to play 520 solitaire games. You will also get Plus Pack with excellent additional card sets, card backs and backgrounds. Only $19.95 USD.